Often, sophisticated style comes out by putting together few basic flattering pieces in a right way. This includes a plain saree and a stark contrasting blouse. 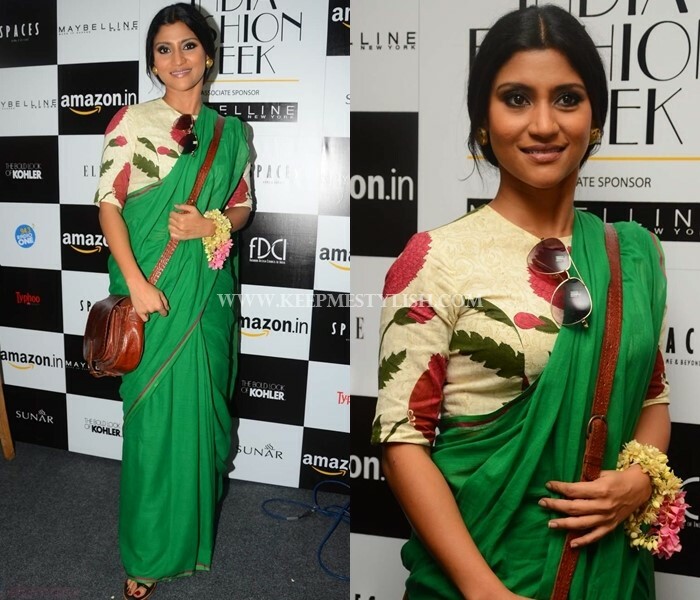 This simple saree stye is a fail proof way to appear dashing anywhere from simple family events to official meetings. 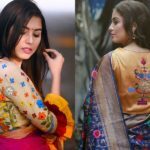 Besides, plain sarees lends the flexibility to team them with variety of blouse designs and fabrics, each time reinforcing a new style and look. So investing in a right material will help you for years to recycle and wear them in variety of ways. Thus, it is very essential to keep few handy ideas ready to make this look work for you. You will surely reap compliments for your minimalistic dressing. 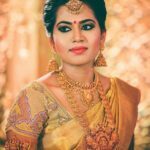 To give pointers on how to wear this saree style, we have curated few chic ways to try plain sarees and contrasting blouses. Read ahead and be ready to try this out. If you like to come up with an edgy style out of your simple plain sarees, wear them with blouse printed with patterns and lines. 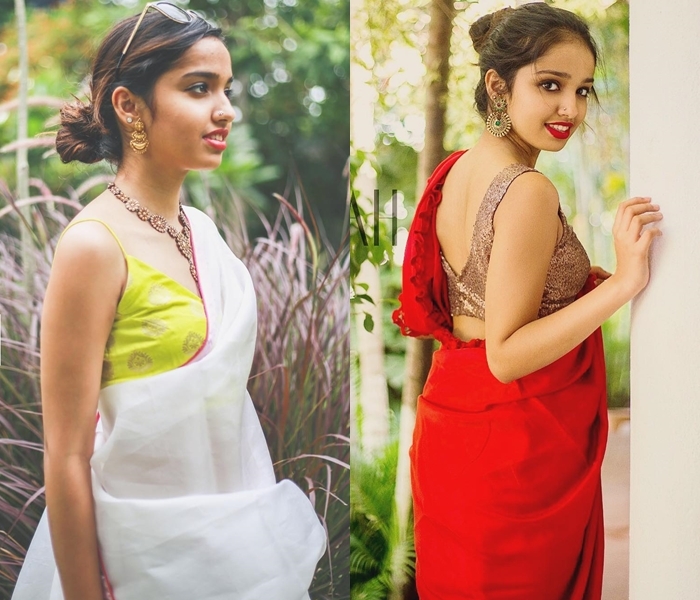 The most popular style is to wear your low-key saree with a stripe blouse. It will instantly give you a designer saree finish. Fine floral work never cease to fancy women. To highlight such pleasing work on your look, go for plain sarees preferably in contrasting shades. Printed floral blouses are trending this season. You can even opt floral embroidery or foral patch work on your blouses to wear it with your sarees. Also Read : This is Why Floral Blouses Are So Perfect for Any Saree! The vibrant kutch work blouses are another great option to try with plain sarees. The colorful thread work makes up for a gorgeous contrasting detail to your blouse. 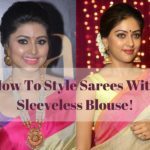 Cut work blouses have been explored a great deal with silk sarees. It is quite a thing for bridal events. However, it is not put to great use for daily wears. Simple light fabric cut work blouses are apt choice for plain sarees. Wear them with a chic belt as below and you will be that stylish diva everyone looks up to! Quirky bold prints and shapes on your blouse need subtler sarees to make them stand out. What else can compliment much better than a single hue saree. Without any barriers for age, this style can be tried by anyone. Elegant mirror work can look incredibly beautiful on attractive hues. Plain sares and mirror work go hand in hand to bring all attraction to them. Obviously it is one of the most attractive option to try. Consider wearing vibrant mix of colors with mirror work to steal the show. This one goes well not just for your casual sarees, but also for silk and other plain designer sarees. Simply put, two flattering colors together and with right amount of thread work is a great way make your saree style striking. 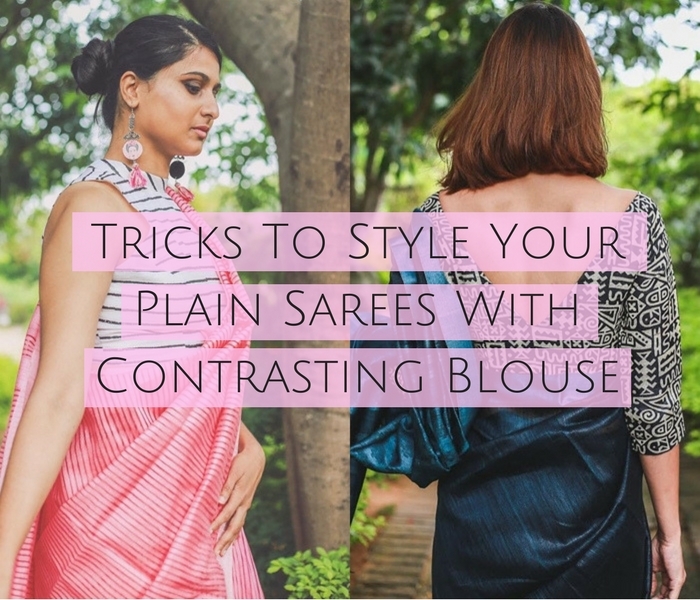 Net blouses go well with plain chiffon and georgette sarees. When you pair them rightly they give you a rich designer saree look without you having to invest on expensive wears. If you like to make an aesthetic feel with your saree style, pairing them with a kalamkari work blouse will do the magic. These blouses are highly popular now. Your plain cotton and handloom sarees will look artistic if you try it with this blouse. Sometimes, a simple contrasting color is enough to perk up the otherwise blunt saree look. A pop of right color can lead your saree to a bright mood. If the saree is of catching color, then a muted blouse shade is a easy way to maintain the balance. These blouse ideas will help you to get started. 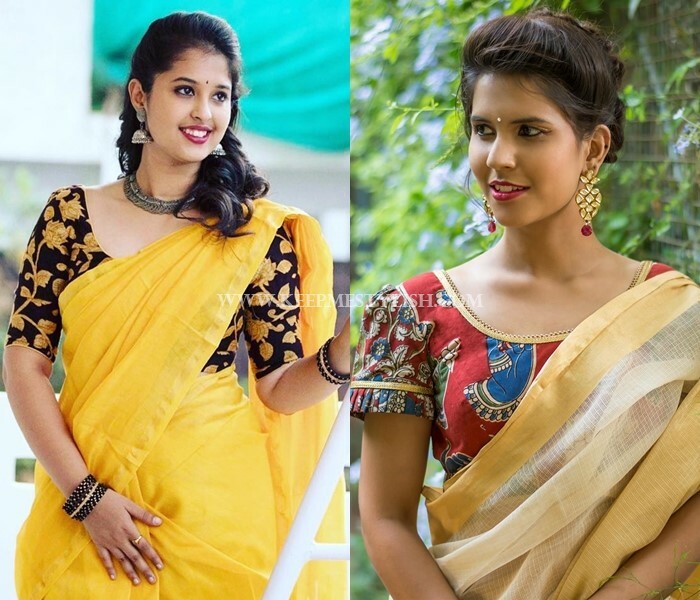 Explore plain saree with contrasting blouses in attractive colors, and be creative in your styling. 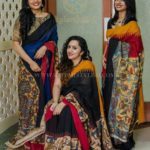 When you get creative, you will figure out that a single plain saree can be made to look new each time by rotating a array of interesting blouse options.